Overall Size: 67-5/8"L x 32-5/8"W x 36"H.
Cooking Area: 24" x 60"
Includes Two 40 lb. Propane Cylinders with Overflow Protection Devices. 304 Stainless Steel Grill Construction. Stackable - Up To Four High. 5" Locking Casters with Brakes. 8 Heavy Wall Stainless Steel Burners. Air Mixers with Debris Guards. Two Stage Regulators on LP Units. 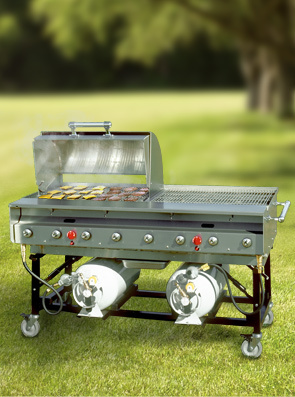 Natural Gas Fired Grill also available.